Ab Jenkins was a building contractor in Salt Lake City, Utah, and former mayor, whose obsession was fast cars, the type that race on the Bonneville Salt Flats near the Great Salt Lake. Jenkins was a member of The Church of Jesus Christ of Latter-day Saints, sometimes casually called the Mormon Church. Jenkins set dozens upon hundreds of speed and endurance records that only ended with his death at age 73 (in Milwaukee, Wisconsin, of a heart attack). Some of his records still stand. Yet, he was more proud of driving over one million miles having never had an accident. 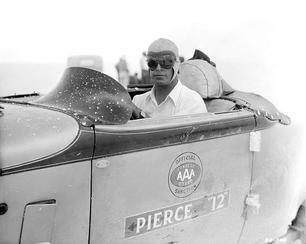 Often called "The World's Safest Speedster" he was the father of salt racing. He valued humanity above all and loved and was beloved. Jenkins began by racing trains on long-distance trips. He was a deeply religious man, who put his faith in God, and by God, he went far, especially driving his “Mormon Meteor” speed machines. Jenkins' son Marv joined him in racing, and together they claimed 28 records. The year after Ab's death, General Motors introduced the 1957 Pontiac “Bonneville” in honor of Ab and Marv’s achievements making it the first, and perhaps the only car to ever “earn” its name and not simply by “given” its name by an automaker. In 2011, the public was lucky to welcome a new documentary film about Ab Jenkins, "Boys of Bonneville — Racing on a Ribbon of Salt." The film not only honors Ab, but the "Mormon Meteor III," Ab's car, which was rebuilt completely for the film. The film is a Larry H. Miller release. The feature-length documentary includes interviews with car collector and TV personality Jay Leno. The film is directed by Curt Wallin. Executive producer is John Price, who believed the story of the Mormon Meteor III needed to be told. Price is founder of the Price Museum of Speed. Ab Jenkins continues to catch the imaginations of car and race enthusiasts, even on the Internet. A Facebook fan page was created and blogs and online magazines feature articles about him. This page was last edited on 2 January 2014, at 15:30.